It’s easy and understandable to look at the reports from multiple outlets that Steve Sarkisian is returning to the Capstone and say “WHAT THE HELL ARE THEY DOING?” That was the question I asked for two years covering the Atlanta Falcons with no definitive answer. However, in retrospect, my tune has changed over the last few months. Although the memories of the 2017 National Title Game (when Sark was Bama OC for a minute) still brings haunting memories, and a 2017 Atlanta Falcons season that was grossly overwhelming, the Falcons still were a top 10 offense in the NFL, even when he was trying to run an offense that was orchestrated by his predecessor Kyle Shannahan. 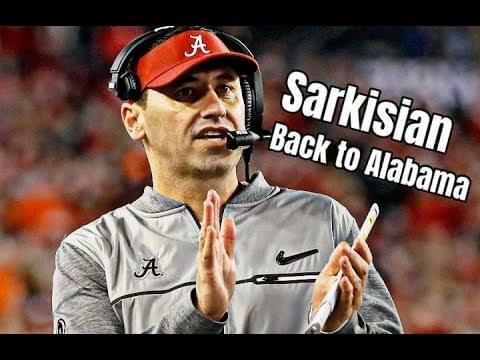 While Sark had his demons he battled and his tenure in Atlanta was a bit underwhelming, Nick Saban had enough trust in him to put him in Lane Kiffin’s spot as he packed his bags for Boca Raton. Also, let’s face it, Nick Saban is better Head Coach than Dan Quinn. He has the college experience and let’s not forget, he was almost had Tua going to USC before he was kicked out the door. And talent can overcome many inefficiences, and Alabama still has it. Sarkisian won’t be running an offense that was made by someone else like he did in the NFL. And let’s throw this out, who else is most likely available other than maybe Matt Canada? Nick Saban has the pick of the litter because many would relish the opportunity to learn from the best, even though it’s a grind.